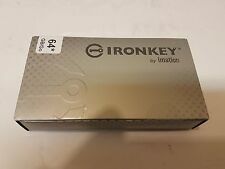 Establish an authentic password to create an identity on the IronKey F100 FlashDrive. Imation Defender f100 64GB New in the Box. AES 256-bit Hardware Encryption. ALL OF THEM TO TAKE A BETTER LOOK. 4 unopened boxes each containing 10 Diskettes. Part number: 11892. 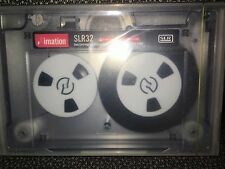 For use with SLR32 and MLR1-32 tape drive and autoloaders. Brand new factory sealed. Ships via USPS. Thanks and good luck. Imation Rainbow 3.5" Floppy Disks Diskettes 30 Pack IBM Formatted 1.44MB 2HD C1. Box is opened but appears to have never been used. Condition is New. Shipped with USPS Priority Mail. IMATION 4GB DEFENDER F200 +BIO Flash Drive USB 2.0 256-BIT ENCRYPTION BRAND NEW! EASILY DEPLOY A FLEXIBLE, WORK-ANYWHERE SOLUTION. IMATION F200 Bio Flash Drives are compatible across multiple platforms without the need to install administrative software or drivers. STAND UP TO UNAUTHORIZED ACCESS Foil unauthorized users by requiring a strong, unique password to unlock data and applications. Two asynchronous serial ports. Located in bin #v2. Use for streaming or polling data. This item is new. You are only receiving what is pictured. Racks, Mounts, & Patch Panels. Lot of 200 D55342K07B1E21R, F15-C01-B05 Fixed Film Resistors T59316. Lot of 500 250LDB, 022806, MSD28774, 21AA13C PCB Boards T75498. Lot of 2000 Tai-Saw Technology (TST) TV0119A IC, VCO, TDMA, SMD, 50 Ohms EMI Fil. Part number: 45640. For use with MLR1 and SLR32 tape drive and autoloaders. TWO NEW tape factory sealed. Used as backup with a Dell PowerVault RD1000 but moving backup to the cloud. Each cartridge will come with a case and has been recently formatted. Product will ship signature required so please buy accordingly. Part number: 46167. 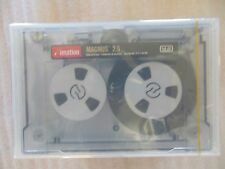 Imation DC 9200 Magnus 2.0 2/4GB SLR4 Data Tape - 46167. TWO sealed boxes of 5 tapes each individually sealed. 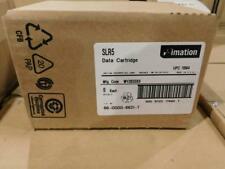 Box of 10 Imation 4MM DDS 90. 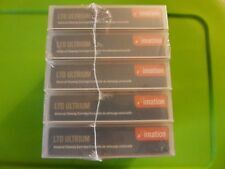 Imation LTO Ultrium-1. Native Capacity. Recording Standard. Tape Length. NO WARRANTY AS IS. Still sealed. Our mission is to create new opportunities by providing affordable personal computers, computer repairs, and internet service to people with limited technological experience due to social, physical, or economic circumstances. NEW IMATION ODYSSEY Removable 80GB Hard Disk Storage System. Hot Swap. Drag and drop - faster and easier storage of data. Open box (bulk) again not used at all 100%. Part number: 46167. 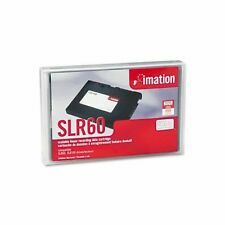 Imation DC 9200 Magnus 2.0 2/4GB SLR4 Data Tape - 46167. One sealed box of 5 tapes individually sealed. 25 IMATION 2HD IBM 1.44 MB DISKETTES . THE BOX IS OPENED BUT IT IS COMPLETE & NONE HAVE BEEN USED. THERE WERE MADE IN THE USA! Imation 8mm D8-160 Data 8 Tape 14GB 7GB . Condition is New. Shipped with USPS First Class Package. They are in a storage case. They are used, but have been reformatted and are empty. They are formatted in the IBM PC format. Part number 42818 represents DDS-1 backup tape developed by Imation. Imation DDS 1 data tape has a smooth tape surface and provides capacity of 2GB in native form. After compression, its recording ability doubles to 4GB. 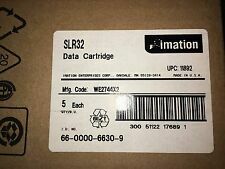 Imation Magnus 2.5 SLR4-5GB Data Cartridge *New* 051111461686. Condition is New. Shipped with USPS Priority Mail. Trending at $16.72eBay determines this price through a machine learned model of the product's sale prices within the last 90 days. Perfect for any enthusiast or collector. If a correct phone number is not provided, we will cancel the order. This is so we can file a claim with the carrier. There are NO EXCEPTIONS. USA Warehouse. And for resolving issues and arbitration. Up to 200GB storage capacity (compressed 2:1). For use with all Ultrium Generation 1 drives, including IBM, HP, Certance (Seagate RSS), StorageTek, ADIC & others. New, Factory Sealed Product. Brand New Imation Diskettes 2HD IBM Formatted Box, 10 Count, 3.5" DS, 1.44MB. Condition is New. Shipped with USPS Priority Mail. Part Number 28109. The RDX Removable Hard Disk Storage System now features certified USB 3.0 SuperSpeed. Manufacturer Imation. Warranty 3 years, limited by Imation. And now the RDX Removable HDD Storage System features certified USB 3.0 SuperSpeed. IMATION 29104. 320GB, 500GB, 1.0TB, & 2.0TB CAPACITIES AVAILABLE AS WELL. 3M Imation DC600A 60MB Data Tape Cartridge . Condition is New. Shipped with USPS First Class Package. This premium cartridge features patented three-piece spool design that guides tape and evenly distributes stress, protecting it along all axes. Factory written servo pattern allows more precise data reading and writing. Compatible with Ultrium LTO1. Provides 100GB maximum native data capacity and 200GB maximum compressed data capacity, transfer rate of 20 - 40MB per second. Ultrium technology is compatible with Seagate, IBM, HP and other leading LTO drive manufacturers. 3590J 1/2″ 10, 20 or 30GB native capacity (uncompressed), drive dependent. • Ultra-smooth recording surface reduces data loss. • Absolute data protection for mission-critical data. 10/20/30 Native Capacity -drive dependent.